I have read about this somewhere on the forum a while ago but despite searching I can't find the thread. I took my car, new in January this year, A4 S-Line Avant, to my local dealer this week to get them to turn the rear lights on at the same time as the front LED DRLs. They could not code it to get this to work. What is the code for this, please? I will then go back to dealer with this information. I think just having front LEDs as DRLs was a mistake by Audi. BMWs and Volvos rightly have both front and rear lights on, IMHO. Glacier White, Perforated Alcantara leather seats, Aluminium Roof Rails, Advanced Key, Audi Sound System, Hill-hold Assist, Comfort Package, Electric Lumbar Support - Front Seats, Interior Light Package, Open Sky Panoramic Sunroof, Sat Nav SD Card Based, Dab Digital Radio, Through Load Facility, Debadged. I would be interested in this as well, and i totally agree that if the front LED's are on then the back should be on to. If the sun is low and bright and i know i am driving just on Auto DRL's i delibratly turn the headlights fully on. 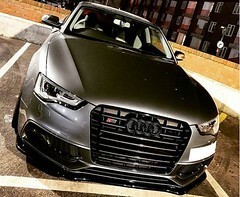 Would have thought it was the same as the S4, turn on side lights and you have front DRL's and rear lights. What do you have on the S Line when you turn sidelights on ? The LED's act as side lights when in the 'sidelight position' on the light switch but they are not as bright as the DRL's. You can override this with VDS (and alter light intensity of the LED's) but you loose the auto dimming function when you indicate. Turning on the side lights also puts the rear lights on but the front LEDs go dimmer (sidelight mode rather than DRL mode). I want to have the rear lights coming on automatically as well as the front DRLs (bright) at the same time. Must admit I had not noticed the dimming down function, is it a big deal after all if the light is poor surely it's time to have the lot on. I did it when I got my car. It's very quick and easy if you have VCDS. Bristle Hound and Meemo like this. ditto on @Dsport , i see this option in Carista. If you are local to Kingston or Southampton, happy to switch it on with carista at any local meets. Oh, something I can use Carista for on my S4, now that I've updated it to V3 I should really have another look to see if it accurately reflects which options are set in my car, V2 just turned up a lot of rubbish last and only time I used it with S4. how do you do it in VCDS? I have VCDS but couldn't find out how to do it? Thanks to pns2007 for the hint. Here is how you do it, for those who get lost in the menus.